The Lafayette Community Garden and Outdoor Learning Center is sponsoring this spring fundraising event. Please join us in this fantastic opportunity to explore Mount Diablo with new eyes. 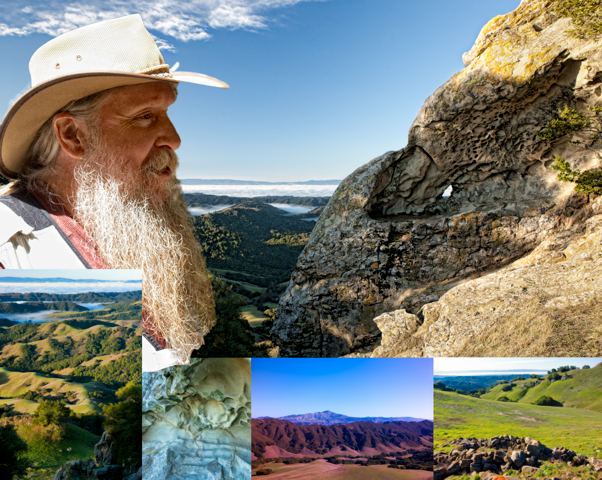 Sunday May 5, 2013 wildlife biologist and naturalist Jim Hale will lead a natural and cultural history interpretive hike to Morgan Territory Regional Preserve. We will meet Jim at the parking lot and staging area to the preserve at 8:30 A.M. for a brief introduction and orientation. At 9 A.M. we will depart on a 5-mile moderate loop saunter as Jim interprets the medicinal and edible uses of wildflowers and native plants. He will introduce us to wildlife and several Native American sites, including Volvon villages, hunting blinds, ceremonial cupule rocks, a prayer circle, bedrock milling stations and other resources. We expect to return by 3 in the afternoon. Bring a lunch and plenty of liquids. Wear appropriate clothing and hiking shoes. We can carpool from the Community Garden or you can meet us at the staging area. Morgan Territory Preserve can be reached by taking Ygnacio Valley Road to Clayton. Take a right on Marsh Creek Road for three miles. Turn right on Morgan Territory Road and continue for 9.4 miles to the staging area at the top of the ridge on the left. Cost: $30/individual; $50/Family This is a tax-deductible donation to Lafayette Community Garden. Limited space is available. To register, email Beth Ferree at bethferree@comcast.net. This entry was posted in Community Events, News & Events, Outdoor Learning Center and tagged edible native plants, medicinal plants, Native Americans. Planting first vegies of the year!